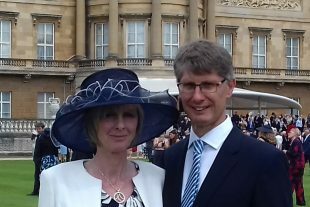 I was honoured to receive the invitation to attend Buckingham Palace in acknowledgement of my role in helping the UK government deal with a backlog of radioactive material that’s been stuck in limbo around the country for years. It was a lovely surprise that is actually a tribute to the work carried out by the whole team over several years. The material (sealed radioactive sources) was (and still is) used for entirely harmless/production purposes by scores of universities, hospitals, schools and businesses. 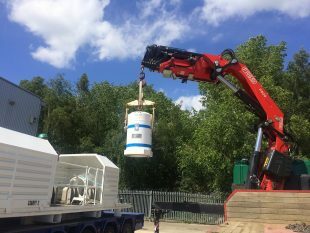 Once finished with, it’s sealed in containers around the same size as a 10-litre paint tin and needs to be disposed of carefully, in line with regulations designed to protect people’s health and the environment. We’ve been accumulating it for decades as a by-product of numerous medical, research and industrial processes – even school chemistry experiments. The old method for dealing with them became unworkable about 15 years ago and we’ve been in need of a reliable replacement ever since. We now have a solution that is cost-effective and will work well into the future. The former method of dealing with sealed sources, which was provided by Sellafield, involved transporting the material to one of the west Cumbrian site’s specialist facilities, where it was repacked before being moved to a different store for safekeeping ahead of eventual disposal in a Geological Disposal Facility. But, because of increased decommissioning activities across our 17 sites, the receiving facility at Sellafield came under growing pressure. Its main function is as a transfer station for larger and more heavily radioactive quantities of waste from nuclear sites across the UK. The sealed sources were something of an extra activity and transfers were suspended at Sellafield, but continued for a while at a Harwell facility … until this was decommissioned. There are now literally tens of thousands of ‘sealed sources’ dotted around the UK, kept in stores belonging to the users of the material and the licensed commercial collection agencies who collect them. As the NDA’s National Programme Delivery Manager, I became involved several years ago. In seeking a solution, I turned to tour specialist transport subsidiary International Nuclear Services (INS). The INS team identified half a dozen shielded transport containers, known as flasks, which were no longer needed at our Magnox Chapelcross site near Annan in the Scottish borders. The flasks required modifications, refurbishment, and the relevant permissions and licenses before they became suitable for transporting more than 99% of all sealed sources. The packaging arrangements, within the flasks, were designed to be suitable for direct disposal to a GDF, without re-working, when this becomes available in future decades. There are about 20 million transports involving all types of nuclear materials taking place around the world each year, mostly by road. Before any such move can take place in the UK, all the nuclear safety and security arrangements are carefully scrutinised and approved by the Office for Nuclear Regulation.